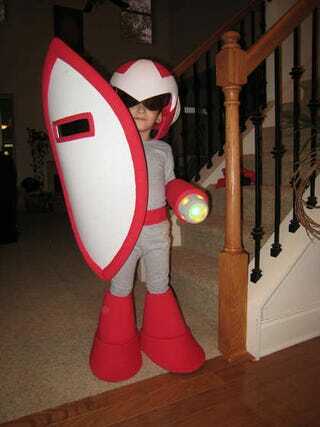 A kid's Proto Man costume from Instructables. Picture sent in by reader Brad showing the costume of a game designer buddy of his. Jordon sent us this pic from his website. Yes, a video of our favorite Red Dead Redemption anti-hero. A Creeper at work, as sent in by Michael. Makoto Asada, 360 Producer, dressed as Big Burn from Pink Sweets and Yukihiro Masaki, dressed as KINGbachi from CAVE WORLD. Reader Sninja13's amazing 8-Bit Super Mario Costume. Homemade Angry Bird costumes from The Clock Blog. Some of their reader submitted Angry Bird costumes. King Koopa spotted on Reddit. As seen on Irrational's Halloween 2010 Spooktacular. This is Mikey Neumann from Gearbox dressed as Scooter from Borderlands (the character he writes and voices). The costume has been 'inked' just like in game by company artists.